turbulent political environment. He was a capable organizer but he was vindictive and harsh to real and imagined enemies. He did not hesitate to wield power, once he acquired it, to the end of defeating the Confederacy. He used the press destroy the reputations of powerful people, such as Democrats of the time who spoke out against the Republicans’ ( Lincoln’s ) policies. He imprisoned thousands of the less powerful who showed resistance to the all-out loyalty he demanded. He manipulated military furloughs during the civil war to essentially stack the votes in favour of the Republicans in possible disctricts where there was possibility of losing seats in Congress. He basically used every trick in the book ( for his times ) . At the same time he walked a tightrope to assist the radical abolitionist cause in Lincoln’s government – when it suited him and when he could ensure it did not go to far. It was never publicly clear whether he actually personally wanted to see true emancipation or not – seems likely he did not want things to go ‘too far’, but that position, like most others he voiced, was typically ambiguous and people heard what they wanted to hear when he actually took some position or other. We read fascinating cases of intrigue, treachery, duplicity, debate and backroom power plays that went on under his auspices. His relationship to Lincoln was nuanced, as Lincoln realized he needed Stanton and was willing in most cases to turn a blind eye on abuses of power. This surely echoes many current political relationships in governments of our time. In some cases, Stanton’s panic over possible Confederate encroachment on Washington hindered important military opportunities. Stanton did act decisively and it was he who paved the was for U.S. Grant into highest military office, when Grant showed his determination to fight and win, unlike most other Union generals before him. In some cases he messed up badly, such as in his refusal to condone prisoner exchanges at one point for extended periods. This caused much preventable death and suffering of captured soldiers on both sides and Stanton ensured that others took the blame for his own decisions – such as the Confederate commander of Andersonville camp. I found this a good book which took the time needed to explain the details and complexity of a turbulent period of American history. 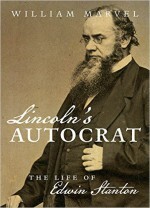 This entry was posted in Uncategorized and tagged American History, Biography, Book reviews, Civil War, Lincoln, Stanton. Bookmark the permalink.